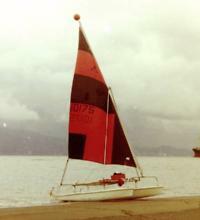 Some years ago, around 1984 before I inherited Alastor, I had an Aqua-Cat - a precursor to the Hobie Cat with a lateen rig and tubular aluminium rigging, seen below. We used to sail it in English Bay. 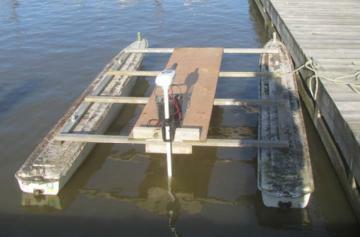 It had sealed GRP hulls filled with a combination of styrofoam blocks and polyurethane foam. After a while, it was apparent that the hulls were leaking and the foam was getting wet - the hulls were heavier than they should have been. Around 1985, I split the hulls open and removed the wet foam. Following my acquisition of Alastor, the cat sat in our garden collecting a patina of dirt and lichen for many years, with the trampoline bed being occasionally used as a literal trampoline until the stitching rotted and the fabric broke. Later, someone stole the tubular aluminium frame, presumably for the metal. 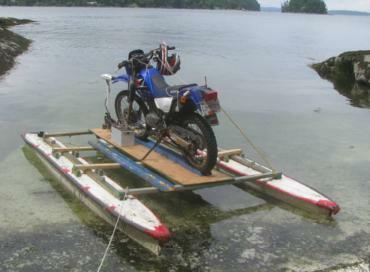 In 2008, I started bringing my motorcycle on board Alastor, which greatly extended my travel options ashore. 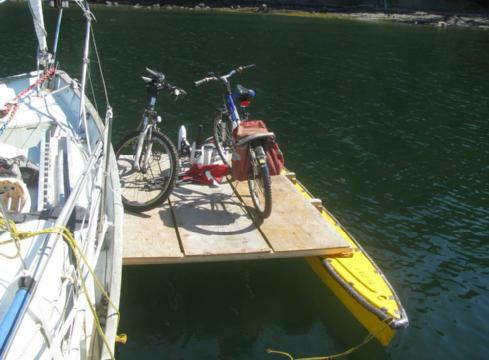 But getting the bike ashore required a dock, and many places I visit don't have one. Putting the bike on Alastor's "official" tender, an Avon Redcrest, would be totally impractical and would probably lead to the bike sinking to the bottom, even though I've done that with a bicycle. Then I thought of the cat. Worth trying, without spending any real money anyway. 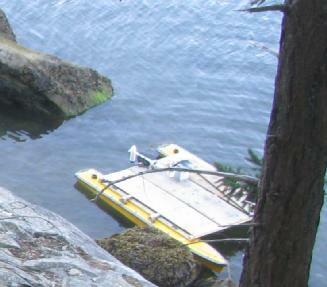 First I had to rescue it from under a fallen tree, then patch up and re-seal the hulls. Then, since the frame was missing, I used some old lengths of 2x3 wood to make a simple frame, and added an old piece of 2x8ft plywood. Then the critical experiment - it did indeed take the weight of the bike, and myself as long as I didn't stand right at one stern. I had an electric trolling motor I'd bought to use with the Avon, and made a mounting block to take that - it worked much better on the cat than on the inflatable. 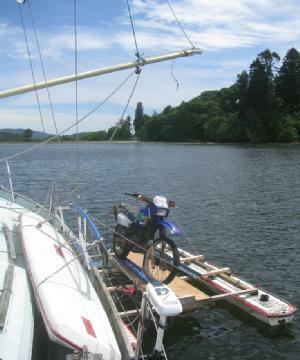 Initially I used the spinnaker pole and a block to lower the bike onto the cat, but later cut some of the original aqua-cat mast to make a derrick. It's still not completely satisfactory. Later, the original 2x3 wood along the hull broke, so I replaced it with new 2x4, and also painted the hulls yellow to somewhat mask the age discolouration. The hulls still leak - somewhere - but with drain plugs on each stern it is not too onerous to empty a few litres of water every couple of days. The hulls still have some built-in buoyancy, in the form of a few foam blocks and sealed milk containers, so worst case the hulls should not sink to the bottom if totally flooded. The cat has a polypropylene tow bridle - another "found" item - which since it floats does not risk getting caught round the prop when reversing. 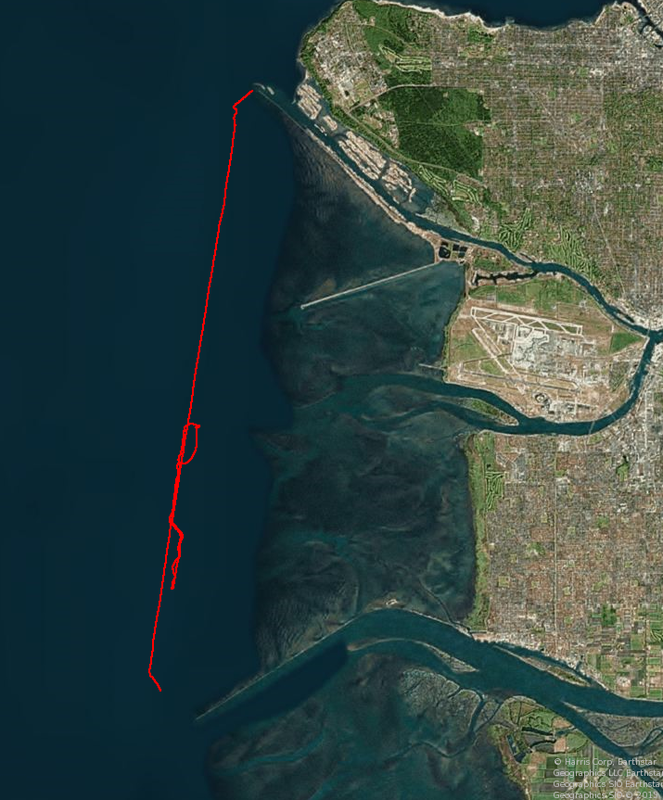 In April 2015 I was returning from Point Grey to Ladner via Sand Heads, towing the cat behind Alastor, with the bridle cleated with several turns on a cockpit cleat. I had motored several miles across Burrard Inlet from Bowen Island, then into the North Arm and back, and the bridle seemed secure. But 90-odd minutes later, nearing Sand Heads, the cat was no longer astern. This was about 9pm - somewhat after sunset, and quite dark. But it was fairly calm - not much wind, and little swell - so I determined to turn back and look for it. There was a stretch of about 13km to search, which seemed hopeless, but nothing ventured, nothing gained. Vancouver airport is located on Sea Island, just to the east, and is well lit. So sailing north, looking west to port it was dark and hard to see anything, but looking east to starboard it was a bit lighter, the lights of the airport and city some 8km away reflected off the water. 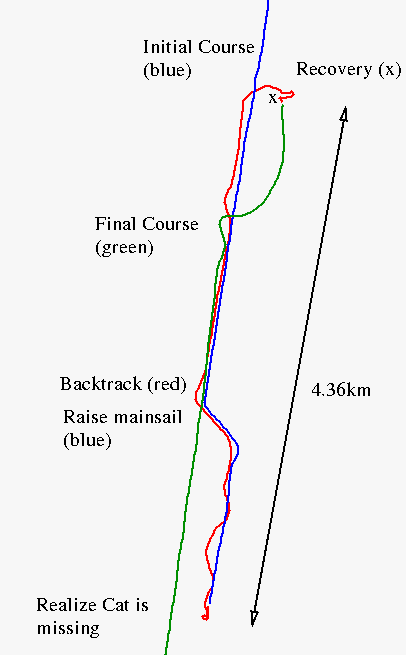 I reasoned that it should be easiest to see something to starboard, so using the GPS I steered a reverse course which was supposed to be a couple of hundred metres west of my southward course. It didn't quite work out like that , but that was the idea. There was a some wind from the south-east, and halfway down I had raised sail with a short dog-leg into the wind. In theory, that might have pushed the cat to the north-west, but I thought it more likely to drift with the current. This was shortly after high tide; the tidal atlas for Georgia Strait showed the tidal stream as "confused" - not very helpful, but at least not very strong. 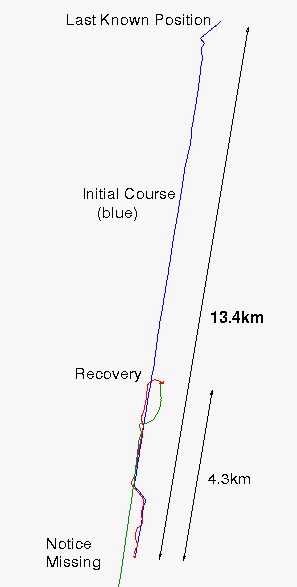 The GPS shows course-over-ground, of course - not ideal, but better than nothing. After back-tracking about 4km, searching with binoculars, I spotted a dark shape in the water almost like a log about 300m to starboard. I turned toward it and lost sight, but found it again after a few moments. Sure enough, it was the catamaran, so after catching the bridle with a boathook I made it fast to a cleat, making sure this time to drop the loop of the bridle over a post as well. I've done this kind of thing before - I found a motorcycle wheel nut searching a 3km stretch of road - but there was a fair bit of luck involved. In retrospect, I should have sailed a return track further west to account for the uncertainty in drift - or perhaps, sailed the one I did northward and then a more westerly one southward again. I should also have put some reflective material and for that matter proper identifying marks on the cat, like "T/T Alastor" - as I hadn't spent much real money on it, only time, I hadn't bothered with making sure it could be found. Probably everyone knew but me that you shouldn't cleat polypropylene - I'll have to be more careful with that, too.